Twitter like most other social media platforms is officially part of our everyday life, either for personal or business use, its become a great way to connect with the world, either by trolling or sharing important information. For business especially, there is always a great need to schedule tweets or automate things in one way or the other. 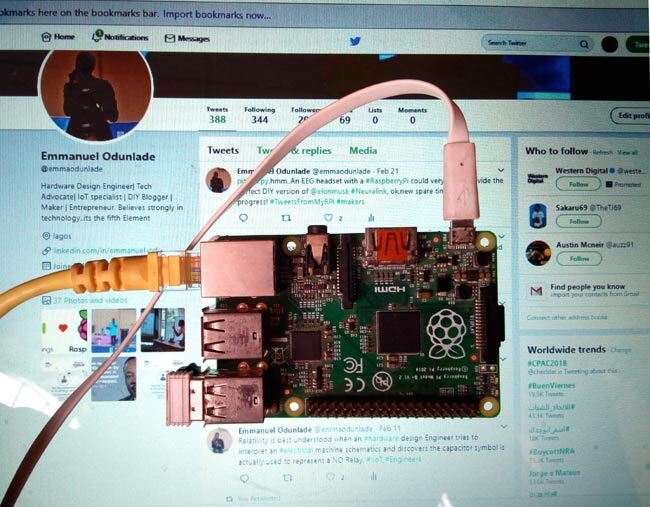 What if there was a way to do that with little or no human supervision once its all setup, that’s why for today’s tutorial, we will focus on equipping our Raspberry Pi with the ability to post and read tweets. This becomes very useful in the case of events where you want the Raspberry Pi to take pictures at random and post them on twitter or when you need to post a thread. Today’s Tutorial relies heavily on the python library, Twython, which is a python module for interfacing with twitter. With twython, we could do most of the things you normally would want to do on your twitter handle like send DMs, Post tweets, read tweets, read DMs, Upload an image, change DP, Change background image, and a lot more. Twython requires authentication from twitter, which can be received by creating a twitter app. All these will be covered in the step by step instructions as we proceed. To proceed, we will be using the Raspbian stretch OS for this tutorial and since its setup is same as that of the Jessie, I will assume you are familiar with setting up the Raspberry Pi with the Raspbian stretch OS. I also want to assume you know how to ssh into the Raspberry Pi using a terminal software like putty. If you have issues with any of the things mentioned, there are tons of Raspberry Pi Tutorials on this website that can help. For new Stretch users (fresh installs), you should note that SSH is disabled and you will need to enable it before you can talk to the raspberry pi over SSH. One way to do this is to activate it by connecting a monitor and enabling ssh, while the second which is my favorite is by creating a file named ssh (with no extension) and copying it to the root folder on your SD card. This can be done by inserting it the SD card into your PC. With that done, lets setup our Raspberry Pi Twitter Bot. The first thing we do is install the Twython library for the Raspberry Pi which is what we will be using to interface with twitter. Follow these steps to install Twython. Step 3: install pip if not previously installed. After these steps, you should have Twython installed and ready to be used by python. Next we create the Twitter App. To be able to interact with twitter from outside the twitter domain, we need the twitter API and to have access to that, we need to create a new twitter app, whose details will then be used by the Twython library to connect the our python script to twitter. Follow the steps below to get it up and running. Step 2: Fill in the details. An example is shown below. Go through the developer agreement, if you are ok with it, hit submit. Yup, the app is created. Step 3: Next we generate the access tokens which will be used to access twitter from our python script. Step 4: You will also need the consumer secret and the consumer key which is also found under the keys and access tokens section to set up the Twython. With our access keys and tokens in hand and the Twython library installed, we are ready to write the script with which we will be able to post messages to or read messages from twitter. If you already have a project folder for your Raspberry Pi projects, CD into it. if not, it’s better to create one to keep your work organized and all in one place. PS: you can call it whatever name you desire. You can also call this any name you desire. Ensure to input the access tokens and keys from the twitter app we created earlier, before saving and exiting the editor. Enter Ctrl + X followed by Y to save while exiting the editor. So one of the coolest things we could do is automate the data being posted by the PI, so if you were working on a temperature and humidity based project for instance and you want the data to be available to the general public, or a traffic tweeting device. All you will need do basically is include the script that measures your temperature and humidity for instance and create a cron job to automate the script. So in this example I’m going to assume we are at an event and I want the raspberry pi to tweet images from the event autonomously. Then as we did the first script, make this an executable too. To create a cron job and add these lines below it depending on the timing you want. This cron job runs every minute due to the timing indicated by the asterisks, but you can set your own timing as described below. More information on how to use the cron job timing can be found in the description of any of the editor you chose to use. For example I prefer vim for no particular reason and here is a description of how to use the timing. So I posted a couple of tweets, worked like a charm. That’s it for this tutorial guys, feel free to drop any question you might have in the comment section, and also follow me on twitter: @emmaodunlade to see more awesome tweets from my mi pi. Followed the steps and had my own twitter bot in about 10 minutes. The section about the auth keys could be expanded a bit. Regarding the Access token, does it contain our Owner ID or do we leave that out? Also when attempting to enter sudo python pitwits.py ‘yee-haw, my Pi tweets’ I get the terminal error message " No module named requests_oauthlib "